But somewhere in there (not in the Nordhaus section), it was asserted that the U.S. federal government does not tax carbon. In fact, such a tax exists: it’s the federal gas tax. Given that this is the carbon-tax-that-time-forgot, I can understand the mistake (the reporter was probably thinking about more sweeping, new taxes on carbon emissions). But there are two strong reasons for raising it. One, to more accurately price the social cost of carbon consumption, and two, to pay for our eroding transportation infrastructure. The federal gas tax has been stuck–in nominal terms!–at 18.3 cents per gallon since 1993. 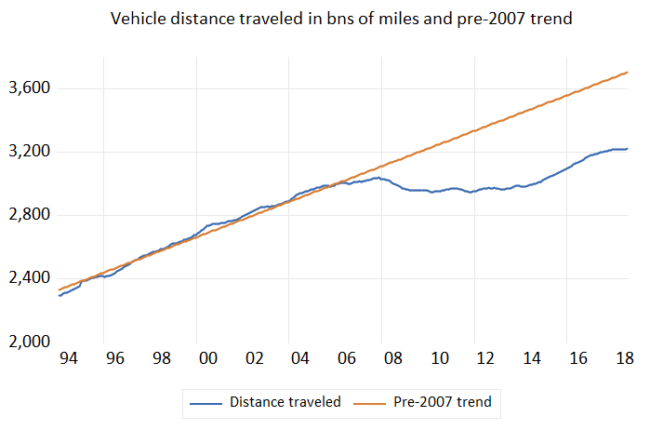 It hasn’t been adjusted for consumer inflation, for the increased cost of transportation maintenance, for the improved fuel efficiency of today’s fleet, or for the slower growth over the past decade in total miles driven (see the figure below, showing a 12-month rolling average of total vehicle miles driven, in billions; people traveled a lot less in the downturn, such that miles driven are down by 480 billion relative to the pre-2007 trend; that’s good for the climate; bad for the trust fund coffers). To be clear, those last two factors are roundly welcomed. But they also mean we’re collecting a lot less than we should be, which besides under-pricing carbon, is why a) the federal transportation trust fund is always broke, and b) our roads and mass transit suffer from persistent under-investment, especially in state that haven’t picked up some of the slack (the average state gas tax is 24 cents/gallon). The tax analysts at ITEP do an excellent job of following this issue, but it is one that should be far more prominent. They calculate that to keep pace with the factors just noted, the federal gas tax today would need to be about 50 cents/gallon. Since the federal gas tax was introduced in the 1930, this is the longest we’ve gone without raising it. Even President Reagan raised the damn thing (from 4 to 9 cents, in 1983)! As I document here, every once and a while, grown-up politicians propose an increase, often a bipartisan one. (BTW, as electric vehicles become more common–they don’t use gas; they do use roads–a per-mile user fee may be necessary to support transportation infrastructure). As the Daily podcast stressed, there are policy makers who increasingly realize we must tax carbon, though especially in the age of Trump, they tend not to speak up much in this country. Moreover, it’s typically easier to add to an existing tax than introduce a new one. Of course, I admit that it’s awfully hard to imagine a federal gas tax increase getting anywhere these days. But we’ve got to try, and we certainly can’t forget that it exists! Source: DOT, Fed Highway Admin. Share the post "An important correction: The U.S. does have a carbon tax. But it needs some serious attention." 4 comments in reply to "An important correction: The U.S. does have a carbon tax. But it needs some serious attention." Increasing revenues for infrastructure is necessary but we need to account for the regressive nature of gas taxes. Lower wage earners often have long commutes due to housing prices. A Vehicle Miles Traveled tax regime, since it can be based on a secure data store manufactured into vehicles, would allow public policy to differentiate on urban-rural factors to be fairer to rural residents if desired in a State, and easily adjusted by vehicle sizes, and even by income strata with some work. Lots of new jobs in going to this direction. Can still have a gas tax too, though lowering it back to Reagan era levels would help with the regressivity concerns, have great optics, while incenting drivers to buy fuel efficient cars (you too can avoid the extra 7 cents by buying an electric vehicle). Lots more jobs here while we address climate concerns as well. And all this would be able to raise revenues in a less regressive way, revenues that could finance public policy goals, as determined by our legislatures. “Adjusted for inflation” should be a clause in every single law regarding financial matters. Yes, it’s long past time that we raise the Fed Gas Tax (another reason I hate the GOP), but it only hits a (non-trivial but kinda) small portion of US Carbon contribution to Global Warming. A decent Carbon Tax – targeted to avoid dangerous change to our atmosphere – can’t ignore the rest of the petrochemical “palette”, starting with coal, oil, & (gaseous) gas.